It is red, slightly sweet and slightly effervescent, that is how I would describe Brachetto d’Acqui DOCG, a wine I fell in love with when I was living in Piedmont, Italy several decades ago. I was not a wine drinker at the time and did not have the foresight to know that I would be a student of wine and a professional in the business these many years later. But, this was the wine that started it for me. I was living in Vercelli, a town of 50,000 in Piedmont in northern Italy. The rice capital of Italy, Vercelli is less than an hour drive to famous wine areas such as Asti, Barolo and Barbaresco. Every afternoon during aperitivi time, I would head to a local bar to meet my new Italian friends. I did not speak Italian at the time and would let them order what they wanted for me. And every day I was presented with a refreshing glass of this slightly sweet, slightly sparkling red wine, Brachetto d’Acqui. Brachetto, a plump, dark ruby grape, is one of the many indigenous varieties of Italy. It is grown in the provinces of Asti and Alessandria which are located in the hills of Southern Monferrato in the foothills of the Alps. There are twenty-six small villages within these provinces that are allowed to grow brachetto grapes, with the town of Acqui Terme as one of the principle winemaking communes. It is a region with harsh winters and hot summers, both of which contribute to the high sugar content of the grape. After fermentation, because of the high sugar content in the grape, there is still sugar left in the juice. As the wine sits in a stainless steel tank, this remaining sugar causes a second fermentation to happen, creating the CO2 that makes the bubbles. The result is a “frizzante” style with 5% alcohol or a “spumante” style with 7% alcohol. Both styles offer an aromatic wine with aromas of red fruits, such as strawberry, raspberry and cherry, and flowers, such as roses, violets and orchids. The wine is medium-bodied with a hint of sweetness that is matched by acidity. The brachetto grapes are harvested early in the season, around the first two weeks of September. The wine is then released in early December, just in time for holiday celebrations. So now is the perfect time to try brachetto. There is a chance you already have tasted brachetto but did not realize it. Have you ever seen or tried Banfi’s Rosa Regale? That is actually a Brachetto d’Acqui. The family-owned Castello Banfi, famous for their Tuscan wines, also owns an historic forty-five-hectare estate in Piedmont. The Banfi Rosa Regale is cranberry color with aromas of strawberry, raspberry and rose petals. On the palate, it tastes like fresh raspberries and finishes with crisp acidity. Ca’ dei Mandorli is a family estate that has been producing wine for two centuries, spanning five generations. Their brachetto is a ruby red wine with notes of violets, honey, orange blossom and raspberry on the nose and palate. Braida is a family business run by third generation brother and sister Giuseppe and Raffaella Bologna. The name “Braida” was the nickname given to winemaker Giacomo Bologna’s great-grandfather who was known for playing “pallone elastico” (a ball game typical of the Piedmont region) in the local piazzas. Their ruby red brachetto is fresh with lush fruity aromas. On the palate it is sweet and delicate with a persistent finish. Marenco Winery is run by third generation Michela Marenco and her sisters. Their graceful brachetto is a deep ruby color with aromas of rose petals. On the palate, the wine is subtle and delicate with flavors of raspberries, strawberries and cherry jolly ranchers. Brachetto d’Acqui is known for being an off-dry, low-alcohol, effervescent wine with distinct strawberry characters. But there are some producers who are making a dry, table-wine from brachetto, resulting in a slightly offbeat, light red wine. Sottimano is one of the few estates in Piedmont to produce a dry, still version of brachetto. The grapes come from twenty-year-old vines on a two and a half acre vineyard in Treiso, Piedmont. Produced with indigenous yeasts, fermentation takes about eight days. The wine is kept in stainless steel tanks for eight months, during which malolactic fermentation takes place. The wine is not filtered or fined and the resulting wine has aromas of ripe strawberries, raspberries, candied fruit and rose. The wine has soft tannins and balanced acidity on the palate. Dry brachetto is hard to find and it does not fall under the Brachetto d’Acqui DOCG. 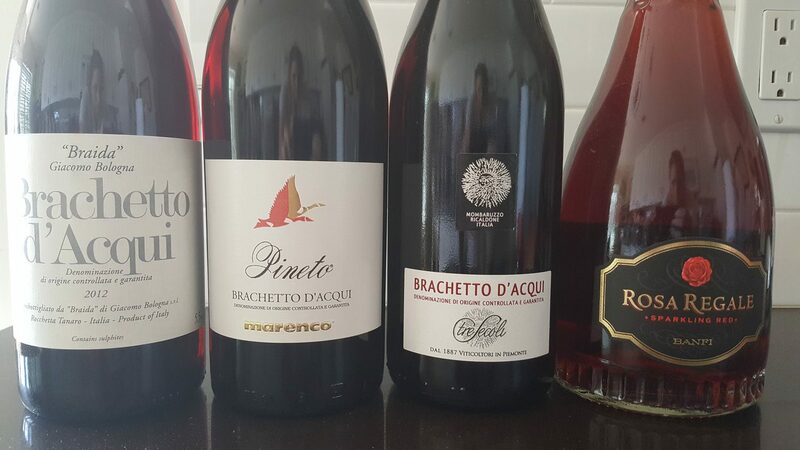 But there is some discussion happening within the Consortium of Brachetto d’Acqui DOCG who have officially requested an amendment of the production regulations in order to admit two new dry versions, one sparking and one dry, of Brachetto d’Acqui. You can enjoy brachetto any time: for a celebration, as an aperitif or as a dessert wine. Served chilled, brachetto pairs beautifully with chocolate, fruit, nuts and cheeses. It can be enjoyed with a piece of dark chocolate, chocolate gelato or chocolate mousse, as well. The fruitiness and acidity of brachetto also pairs with a creamy dessert such as crème brulee or panna cotta. Most recently, I enjoyed a glass of brachetto at a restaurant in San Francisco. We ordered a warm brownie with peanut butter ice cream and payday filling as well as a dessert of baked strawberry with coconut swarnadwipa (a curry spice blend). With the brownie, the fruitiness of the wine shone through and with the baked strawberry, the wine enhanced the elements of the ingredients. Brachetto can also be paired with a soft, creamy cheese, such as brie, camembert or other double and triple crèmes. But the simplest, and in some ways best, pairing is brachetto with a bowl of strawberries or poured over a bowl of fresh sliced peaches. With Brachetto d’Acqui costing approximately $20 per bottle, pick up some to have on hand for the holiday season. I am sure after you have enjoyed a few glasses, you will want to drink it all year ‘round. This entry was posted in Wine and tagged Banfi Rosa Regale, Brachetto d'Acqui, Brachetto d’Acqui DOCG, Braida Brachetto d'Acqui, Ca’ dei Mandorli Le Donne dei Boschi, Italian Wine, Italy, Marenco Pineto Brachetto d'Acqui, Piedmont, sparkling wine, Wine, Wine Tourist Magazine by Allison Levine.